Back with book 5 in the Glass and Steele series and ya’ll, I could serious read these characters and this world for the rest of my life and not be bored. India and Matt are running out of time. They have to find the healing magician in order to fix Matts watch, or he will die. It continues to become weaker and soon enough, it will cease to work at all. 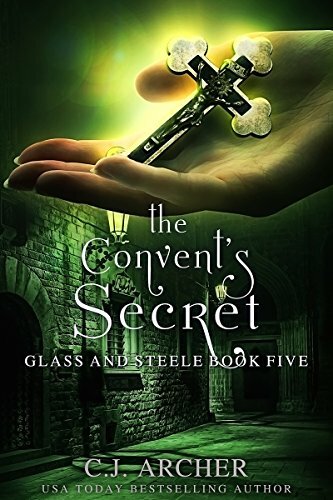 When clues point them to a local convent, Matt and India investigate. The nuns are tight lipped, but they are able to discover that twenty years ago, two infants and the Mother Superior went missing. With the convent actively thwarting their attempts at digging up information, an old enemy intent on taking Matt out, and a family matter that threatens India and Matts happiness together, the sleuthing duo have no shortage of problems to solve and people to be wary of. First and foremost, thank you Jesus we FINALLY have some real feelings sharing between Matt and India. That plot line was literally making me crazy. THEY BELONG TOGETHER PEOPLE! But wouldn’t you know it, OF COURSE, something threatens their happiness and ability to be together. Honestly, I don’t know whats worse, India not being honest with Matt about her feelings in books one through four, or finally bearing their hearts and love to each other only to have his pesky family drama interfere. I like that we get some more fleshing out of some of our beloved secondary characters, most notably, Willie. Having such a diverse kind of character in this time period and setting was unexpected, but books need more of it! We got to see a more vulnerable side to Willie which really gave her much more depth as a character. As with the rest of the books in this series, there was plenty of heart stopping action to keep your adrenaline spiked. I’m not ashamed to admit I gasped, out loud, on more than one occasion in a public setting. Book 6 has been ordered and on the way (thanks Amazon! ), can’t wait to dive into it! This series has proved to be utterly addicting y’all. Book 4 picks up right where three left off. Indian and Matt have finally flushed out Chronos who, coincidentally is India’s (thought to be dead) grandfather! With one piece of the two parts magic required to fix Matthews life saving watch, the two track down any and all leads to find the rumored diary containing the spell needed by a doctor magician to restore Matthews watch, and in turn his health. 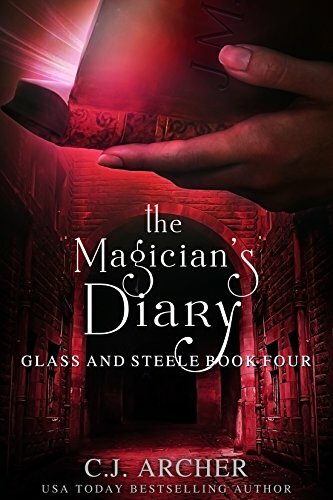 The diary was lost when the doctor magician was murdered over two decades ago, but India and Matt are relentless in their quest. It is obvious they are getting close when Chronos is viciously attacked and the heads of prominent guilds insist they stop their search. Spellbinding read! (See what I did there guys?) Once again India and Matt use their wits and powers of deception to sniff out clues and long buried truths as Matts clocks magic dwindles. There is that same sense of adventure and mystery that I have come to expect with this series. There may have been audible gasps and frantic page turning during my reading. Just when I think I can’t possibly be surprised anymore, Archer totally throws a well placed curveball of a truth bomb totally changing the name of the game! That ending?! Absolutely did not see that coming. Well played Archer, well played. There continues to be this back and forth romantically with India and Matt and honestly it’s making me want to smack some sense into India but I’m hoping book 5 can have her open up some more as far as her feelings and fears are concerned. I am convinced Archer enjoys torturing us readers at this point because I just can’t take it with the romantic tension between those two anymore. Our tried and true sidekicks were an enjoyable bonus to the story, including the blooming relationship between Cyclops and Catherine. How cute are they?! I’m intrigued on Willies plotline and hope more is revealed in the next book. What is she up to?! On to the next in the series! Until next week friends! A local doctor has been murdered, poisoned in fact, shortly after Matt and India paid him a visit to inquire about a recent "miracle" that had occurred and was reported on in the local papers. As Matt and India were some of the last people to see Dr. Hale alive, they are suspects in his murder. In an effort to help clear their names, the two embark on their own investigation to find the real killer. 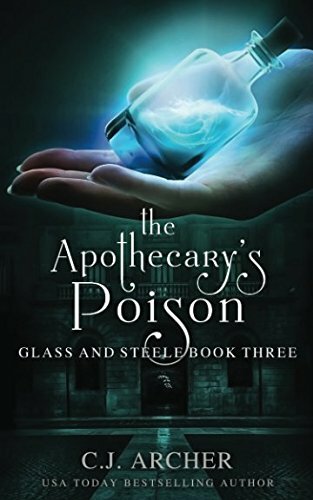 As they discover that he was murdered with an elixir infused with magic, the two investigate the apothecary's guild, customers, and business partners alike. Suspects are piling up, and Matt and India find themselves in increasingly dangerous situations as someone tries to get them to back off the investigation. The two must race the clock (quite literally as Matt has yet to locate the mysterious Chronos to fix his life giving watch) and locate the real killer before they are taken in by Scotland Year or worse, murdered by the real killer. I enjoy watching these two work cases together and I can see the beginning to a great segue into a career for the two of them together. They are both smart and clever, balancing out each others shortcomings and drawing on each others strengths to make a pretty dynamic duo. As far as the plot, the plethora of suspects kept my wheels turning and there was no lack of action in this book. Our main characters were placed in plenty of heart stopping (some quite literally) situations which left me sweaty and anxious. You know that's some good writing when you feel physical symptoms after an intense scene. I suppose I will now be forced to stalk my mailbox as I anxiously await the delivery of book 4! With that shocking cliff hanger I would suggest just going ahead and buying the next one before you start this one! Utterly obsessed with this series and cannot read them fast enough! Book two in the Glass & Steele series picks up right after book one. At the request of Commissioner Munro, Matt and India have been tasked with finding the whereabouts of a missing mapmakers apprentice (also the Commissioners illegitimate son). The young man, Daniel, recently showed exceptional skill and aptitude at his trade as a mapmaker, and had recently commissioned the sale of a custom map to an unknown buyer, something practically unheard of for a young apprentice of only a few weeks. Matt and India begin to suspect that magic is in play when they begin to investigate. Daniel was a magical mapmaker and all signs point to his magic being a main factor in his disappearance. Matt's health is still failing, and the crew continue to look for clues as to the whereabouts of the mysterious Chronos. Can they find the missing boy before it's too late? And can any headway be made into fixing Matts timepiece as it continues to dwindle in power? Another amazing read by C.J. Archer! This one was filled with the same interesting and complex plot line, action packed adventure, and deepening bonds between characters. I really enjoyed learning about another guilds (Mapmakers Guild) relationship with magic and how it can be harnessed and utilized. The sleuthing pair, Matt and India, continue to develop their budding relationship in an almost maddening game of "will they wont they". I can only hope the agony of waiting will be worth it because these two are meant to be! (I have a sneaking suspicious it's going to be GLORIOUS! Hence me tearing through the series so quickly). This one definitely kept me guessing and my heart racing, the entire book! Again, the supporting characters, Cyclops, Willie, and Duke were crucial elements of such an enjoyable read as were their loyalty and burgeoning relationships with India. Moving on to the next in the series now, stayed tuned for more! Thoughts on this book in a word? OBSESSED! This one has been on my TBR since Christmas and once I finally got to it this week, I DEVOURED IT! After India Steele's fiance stole her inheritance and promptly dumped her, she is desperate. It isn't easy for a woman alone in 1890's London and things are about to be a whole lot worse as she's kicked out of her rented room for her inability to pay. A gifted watchmaker/repairer like her father before her, India fortuitously meets the enigmatic Matthew Glass. Mr. Glass not only offers India a paying job for a weeks time, but provides her with lodgings while he is in London from America looking for a mysterious watchmaker he met five years prior who has all but vanished. Mr. Glass's obsession with finding this watchmaker seems odd at first, but when India spies Mr. Glass' watch emitting a strange green light that seems to seep into his veins when he appears tired and ill, rejuvenating him, she begins to wonder if there is more to his story then he is letting on. 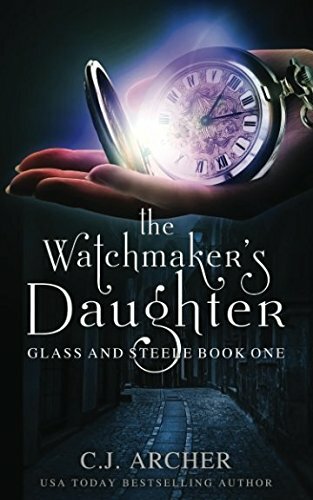 Using her connections from her previous work as her fathers assistant in his watch shop, India and Matthew make their rounds to all the watchmakers in London to inquire about this mysterious man who Matthew is desperate to find. When her once fellow colleagues begin to shun her, and some worse, seem to fear her, India isn't sure what to think. When rumors swirl of a dangerous American outlaw on the loose in London, India thinks she may have made a bargain with a very dangerous man indeed. Stellar read guys! A superbly well written novel that was the perfect blend of mystery and fantasy. C.J Archer did a phenomenal job of playing her cards close to her chest with this one; I found myself rooting for India and Mr. Glass from page one even despite his shady past and uncertain agenda. The supporting characters were so well written and likable I found myself not even caring that we (the reader) weren't too sure of their past or intentions either. The plot was well paced and interesting. There were quite a few moments of heart pounding action ranging from intense fight scenes to steamy lust. I'll just go ahead and let you all know now that I have a major literary crush on Matthew Glass.... I'm not even gonna lie.....as far as fictional characters go he's swoon worthy. 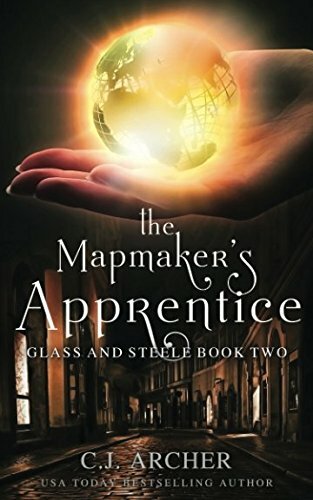 I am jumping into the next in the series, The Mapmaker Apprentice now and can't wait to follow along in India and Matthews next adventure!